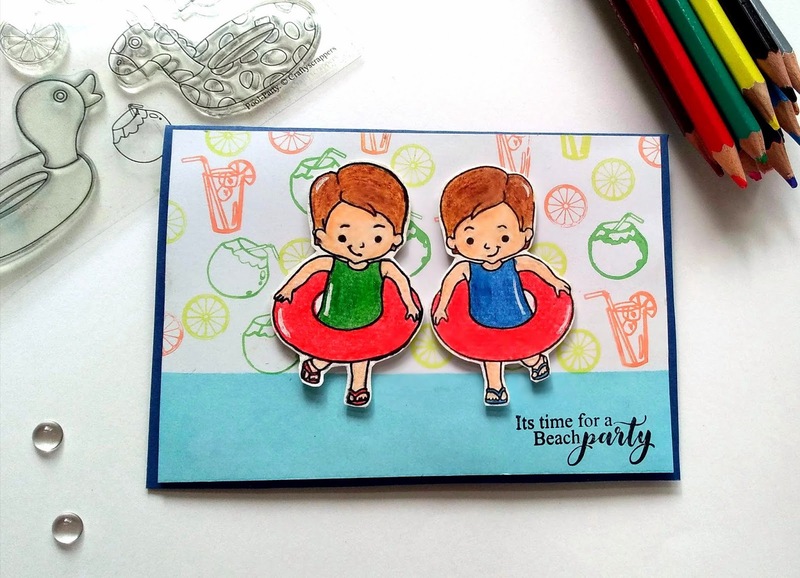 challenge for the month of july at craftyscrappers is "Mirror image stamping".Very interesting and beautiful, isn't it? so, Today I am going to share with you a card where i have done mirror image stamping using craftyscrappers 'pool party' stamp and newly launched 'Mirror stamp'. with step by step tutorial. 1) Firstly, I stamped the image of the boy on white cardstock,colored it using color pencils and fussy cut it. i stamped the image of the boy on one of the mirror stamp and then stamped it again on a cardstock. 3) I colored this image with pencil colors and fussy cut it. 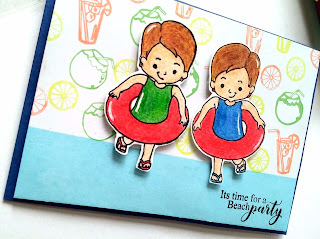 4) i used premium white cardstock from craftyscrappers as a base of my card, for the bottom portion i used tubby craft aqua blue ink and for upper portion i did repetitive stamping using different small stamps from stamp set 'pool party'. 5) I adhered the fussy cut images using adhesive foam tape and stuck entire panel to blue cardstock. 6) I finished my card with stamping the sentiment from same stampset.